The Polish organizations in Lithuania associating doctors, entrepreneurs and combatants have chosen their new leaders. Bernard Niewiadomski was appointed to be the president of the Forum of Polish Entrepreneurship ‘Korona’ for the next two years. 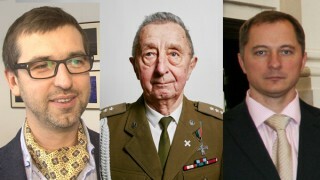 Stanisław Poźniak became the president of the Home Army Veterans Club and Daniel Lipski was chosen to be the president of the Polish Medical Society in Lithuania. In May, the members of the largest Polish organization in Lithuania – the Association of Poles in Lithuania (ZPL, Związek Polaków na Litwie) – will appoint its new leaders. At the beginning of its activity, in 1990, the Home Army Veterans Club had about 80 members – former soldiers of the Vilnius and Navahrudak (Nowogródek) branches of the Home Army. Nowadays, when only 8 members of this organization are the Home Army veterans, the rest of members provide them with support. Wacław Pacyno, the long-standing president of the organization, died in November 2014. Only veterans have right to vote during the elections of the new leaders of the Club. On the 4th of March, they appointed Stanisław Poźniak, who was the vice-president so far, to be the president of the Home Army Veterans Club. In turn, Stanisław Radziewicz was chosen to be the vice-president. Also the Forum of Polish Entrepreneurship ‘Korona’, the organization associating Polish entrepreneurs from the Vilnius region, chose its new leaders. During the annual meeting of Forum members, Bernard Niewiadomski, the co-owner of the Inviktus company, was appointed to be the president for next two years. Andrzej Łuksza, the previous president, and Zygmunt Klonowski were also chosen the members of Forum board. ‘In a long-term perspective, we are going to boost the level of trust in Polish business in Lithuania. It is obvious that Polish business is not particularly respected and privileged neither by society nor by authorities. We want to overcome such a distrust, presenting examples of companies associated in ‘Korona’ – companies operating in a stable way and providing a lot of opportunities for this country. Another objective of our activity is to raise the interest of young people in entrepreneurship. After all, the point is that our country needs as many people creating GDP, working and supporting the budget by paying taxes, as possible. And such a development will not occur if graduates of vocational schools, high schools and universities dream only to get a state job. There should be as many people who create and manage their own businesses, offer other people legal jobs, pay taxes, as possible’, said Bernard Niewiadomski. Niewiadomski eagerly meets with students in schools: ‘During such meetings, I explain that managing one’s own business involves great responsibility; on the other hand, it is more profitable and gives one a lot of satisfaction’. The Forum of Polish Entrepreneurship ‘Korona’ offered a special educational project concerning entrepreneurship to schools; unfortunately, this idea did not raise much interest among teachers. ‘Despite this failure, we do not give up; in time, we will try to present the idea to schools again’, said the new president of ‘Korona’. According to Bernard Niewiadomski, expanding entrepreneurs’ horizons is very significant, that is why courses concerning modern company management, development, entering new markets and motivating employees are to be organized for the members of ‘Korona’. The Polish Medical Society in Lithuania, as the majority of Polish non-governmental organizations in Lithuania, was created in 1989, when many political transformations took place. At the beginning, this organization, associating physicians and nurses, was operating as the Physicians Club within the Association of Poles in Lithuania. Since 1993, it has been operating as the separate non-governmental organization named: The Polish Medical Society in Lithuania (Polskie Stowarzyszenie Medyczne na Litwie). Currently, the society has 115 members. ‘These are skilled people with considerable professional experience. We would really like to engage young doctors in actions taken by our organization. We want to share our experience with people who are beginning their professional careers. Moreover, our society cooperates with many foreign institutions, also these in Poland; we also distribute information about various courses and internships. In turn, young people are very enthusiastic, they have energy and ideas which would be definitely beneficial for our organization’, said Daniel Lipski, the new president of the Polish Medical Society in Lithuania. This year, the society celebrates its 25th anniversary of existence. The international medical conference concerning the history of the Vilnius medicine is going to be one of the most important events for the society in 2015. More information about this conference, which will be held in Vilnius in September, are available on the website of the society: www.psml.lt . According to Daniel Lipski, the society regularly holds lectures and speeches on issues concerning health, active lifestyle and disease prevention. Physicians are also engaged in preserving the Rasos cemetery: they care about the graves of deceased doctors, and moreover, on their own initiative, they raised money for the Rasos cemetery. Such a fund-raising was held last years, for the first time, on the occasion of All Saints’ Day. This action is planned to be continued. At the end of May, the members of the largest Polish organization in Lithuania – the Association of Poles in Lithuania – will be choosing the leaders of the next term. The 14th congress of the association is scheduled for the 30th of May 2015. There are over 30 active Polish non-governmental organizations in Lithuania.